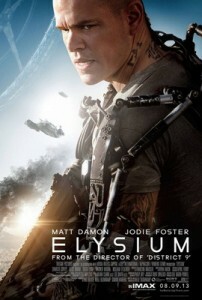 Elysium made it’s way to number one at the box office this weekend, it was a close call. The short of it… Earth is ravaged, the wealthy move off world and on to Elysium. The poor working class dream of getting up to Elysium, while the privileged class there work on keeping them out. The good; Neill Blomkamp’s new film after District 9 keeps in the sci-fi genre. He’s again created a world in which the sci-fi genre is a social metaphor. The film looks amazing, it’s shot beautifully, the special effects are top notch. The world is populated with droids that do the law enforcing, to security detail, to medical assessment/aide, you name it they do it. Limiting the human jobs to manufacture of these droids, keeping the poor… well, poor. Insert Matt Damon, I really like this social commentary, Damon plays Max, the film’s protagonist, he’s an orphan who grew up with some nuns and fell in to the wrong crowd, he’s got a bad record and now working at a factor which makes the droids that keep him on parole. Much like District 9, the action and violence is both graphic and well executed (pun intended). Seeing a man eviscerated as he flees has never looked so good. The bad; Jodie Foster’s in this movie, why? She’s under utilized. The pacing of the film is much faster than Blomkamp’s previous one, I don’t think that’s a good thing here. We didn’t get enough time to live in this world that he’s created, it’s very well thought out and has a system of its own, I wanted more learning how this world works. I wonder if the script could’ve benefited from another draft or two. This entry was posted in Movies/TV, Reviews and tagged Elysium, Elysium film, Elysium movie, Elysium movie review, movie review, sci-fi on August 13, 2013 by Eugene.